Welcome to The In-App Purchase Inspector - our regular look at free-to-play mobile game monetisation from the consumer's perspective. This time we're looking at Ubisoft’s Assassin’s Creed: Rebellion. Given the controversy currently surrounding the transition of much-loved PC/console franchises to mobile, it’s worth pointing out from the get-go that Assassin’s Creed: Rebellion is a very different game compared to the complex 3D stealth parkour - and increasing open-world expansiveness - of its core franchise. The first Assassin’s Creed game built from-the-ground-up as a free-to-play mobile experience, Rebellion doesn’t only add role-playing elements to its action but contains a core base-building foundation too. Graphically, it's also a Chibi-styled 2D game with a strongly autoplay-focused metagame. Given that approach, the link to the console Assassin’s Creed games could be viewed as fairly lightweight. You unlock signature assassins from those games with characters including the likes of Ezio, Aguilar and Shao Jun highlighted. Aside from this - and the nominal setting, which sees you battling the Knights Templar in Renaissance Spain - Rebellion is very much its own experience. Interestingly, some significant elements have resulted from the game’s long - 17 month - soft launch, which has seen Ubisoft and developer Behaviour Interactive (of Fallout Shelter fame) create a much deeper metagame than that which was originally tested. The game’s long soft launch period has resulted in the emergence of a much deeper metagame. 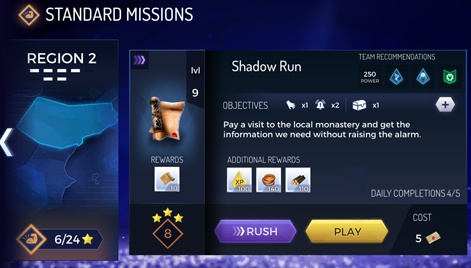 Notable in this respect is the addition of the rush mode, which enables players to gain instant rewards from missions already three-star completed, and the auto-play mode, whereby once the player has selected their three-person squad, the game’s AI controls all the movement and turn-based battles through to victory or defeat. Popularised by Asian F2P mobile games developers, both elements are now standard in many mobile gaming genres but still retain stigma in the eyes of those who prioritise gameplay over metagame. Given the history of the Assassin’s Creed games, it was perhaps no surprise then that these elements weren’t included at the start of the soft launch. So it’s to Ubisoft and Behaviour’s credit they eventually accepted these are now a necessity for any F2P mobile game that hopes to generate long-term success. Despite their inclusion, Assassin’s Creed: Rebellion in no way feels like an exploitative game with respect to monetisation, however. There’s no hard sell or egregious content gating; players are well rewarded for just playing the game and there’s always plenty to do and tinker with. Of course, the core progression element is unlocking new assassins and levelling up the ones you have. Rebellion launches with 46 characters, each of which has different stats broadly split into stealth, support and tank combat characteristics, as well as crafting and research abilities when it comes to base-building activities. There’s also the usual demarcation in terms of common, rare, epic and legendary characters, which feeds into a gacha loot box system (here called DNA Cubes), whereby players need to collect the random DNA fragments each cube drops to unlock and then upgrade their assassins. Low-quality cubes are gifted every four hours, while better quality cubes become available the more you play. Obviously, players who want to progress quicker will have to spend money, with the default option being 120 DNA fragments for 1,800 Credits (the game’s hard currency, which roughly converts to 100 credits per $1). There are more direct bundle deals too, whereby players can instantly recruit and power up specific assassins, gaining more general resources into the bargain. Another layer for the assassins is provided via their equippable gear, which players have to craft using a new set of resources. And, more generally, underpinning everything is base-building. Assassin’s Creed: Rebellion has a lot of interlinked layers, which makes it a rather daunting experience for new players. The base has its own resource economy and levelling system for individual rooms, which are required respectively for item crafting, character progression and resource gathering, including the energy system which gates how quickly players can power through the missions and special events. Simply put then, Assassin’s Creed: Rebellion has a lot of interlinked layers, which makes it a rather daunting experience for new players. Helping them make sense of what they should be doing is down to the daily objectives list, but even so, the game’s first challenge will likely be retaining the large numbers of users its release will no doubt generate. It will also be interesting to see how quickly additional retention and monetisation features such as guilds or alliances will be added to a game that launches as a single-player experience and relies on time-limited events to provide additional engagement. More generally, however, the metagame design and hence the monetisation of Assassin’s Creed: Rebellion follows current best practice in terms of F2P mobile game trends. Aside from some interesting monthly subscription deals, it’s not really doing much new. And in that respect, unless you’re an Assassin’s Creed fan with the hard-nosed attitude of a Diablo player at BlizzCon, there’s little to complain about in Assassin’s Creed: Rebellion. Meanwhile, those inclined towards F2P mobile gaming will enjoy both the brand’s cache and the title's polished implementation.